L, N, P, R, M, Q, T and Y are the members of a committee sitting around a circular table but not facing the centre. Each member has a different zodiac sign, viz Leo, Virgo, Libra, Cancer, Aries, Gemini, Pisces and Scorpio, but not necessarily in the same order. T is third to the right of P. The one whose sun-sign Leo is second to the left of the one whose sun-sign is Libra. Y's sun-sign is Libra and is sitting exactly between P and L. The one whose sun-sign is Pisces sits second to the right of N. The one whose sun-sign is Aries is second to the right of the person whose sun-sign is Gemini. P sits third to the left of the person whose sun-sign is Virgo. Neither Q nor L is the immediate neighbour of N. Q is fourth to the left of L. N's sun-sign is neither Cancer nor Ariel. The person whose sun-sign is Leo is sitting second to the right of the person whose sign is Cancer. R’s sun-sign is Leo and is not an immediate neighbor of N.
1. Which of the following is N’s sun-sign? 2. Who sits third to the right of L? 3. What is Y's position with respect to Q? 4. How many persons are there between P and N? 5. What is the sun-sign of P? 6. Which of the following combinations is true? I'm new to Reasoning and competitive exams. I'm having difficulty to understand how the above problem was worked out. If possible could you please provide a Step-By-Step explanation of how to map the above. how can we solve syllogism problem ? Please provide some solutions on both in and out circular seating arrangement with tricks. Sir/Madam, Could you pls explain how to approch these 2 entities problems in circular arrangement. I have gone through your previous post. It is Awesome. I will try to provide the explanation you asked, give me some time for that. It is given that N can't be Ares in the 3rd sentence from last. There are so many examples here search them in "Feeling Lost" with appropriate names. will post the steps for solving this problem in sometime. Draw a circle with eight empty boxes. And name the empty boxes as 1,2,3,4,5,6,7 and 8 ( I am naming them in numbers in anti-clockwise direction just to explain where to place the persons; as I cant draw the circle for each step). Tip: Mark the left and right postions for each person box with notations “l” and “r”. Doing so, it would save some time solving the problem. From the question, we can place two persons rightaway, that is Leo and Libra. Ques: The one whose sun-sign Leo is second to the left of the one whose sun-sign is Libra. Leo is in box 3. Ques: Y's sun-sign is Libra and is sitting exactly between P and L.
Y is Libra, so Y is in box 1. Block the boxes 8 and 2 for P and L.
R is Leo and is in box 3. Leo is second to right of Cancer. Hence put Cancer in box 5. Ques: N's sun-sign is neither Cancer nor Ariel. The one whose sun-sign is Pisces sits second to the right of N. R’s sun-sign is Leo and is not an immediate neighbor of N.
Now we will try to place N.
Filled boxes so far: Y in box 1, R in box 3, P or L in box 2 or 8, Cancer in 5. So N can sit in 4 or 6 or 7. So N sits in box 6 and Pisces sits in box 4. Ques: P sits third to the left of the person whose sun-sign is Virgo. P can sit in 8 or 2. If P sits in 8, it becomes third to the left of Cancer who is in box 5. And Virgo sits in box 7. Ques: T is third to the right of P. Q is fourth to the left of L.
now T sits in box 7 and is a Virgo. Q sits in box 4 and is a Pisces. We placed all persons except M. hence M sits in box 5 and is a Cancer. Ques: . N's sun-sign is neither Cancer nor Aries. Aries is second to the right of the person whose sun-sign is Gemini. N can’t be Aries. Hence N must be Gemini or Scorpio. If N is Gemini, then Aries cant be the second to its right. As N’s second to its right is Pisces(already solved). So N is a Scorpio. Ques: . The one whose sun-sign is Aries is second to the right of the person whose sun-sign is Gemini. L is Aries in box 8 and Gemini is P in box 2. Hi, I have only one issue in approaching this. Here in this question, the positions of T,P & Leo, Libra are confirmed. So, how did you chose Leo,Libra to start with? Why not T,P? Hi Sibivel, read the question at a glance completely. You will always find you can place two persons rightaway. 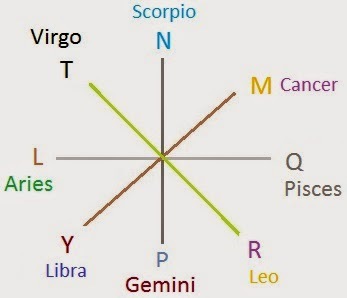 In this question, you can see there are many related relations to Leo and Libra. Thats y we choose Leo and Libra. Find the person whose name appears many times in the ques. Well done Angel... that was spot on. sir/madam its very good e.g but i took 3 mins to crack it was that good or slow . i mean how much time sould it take to crack 1 question? Time taken depends on persons and practice Anuj we can't say exactly about it. Some might be good at Reasoning but takes more time in English or any other topic. But my advice is keep practising more on which you are not good at, so that, it will become like child's play to solve. could you please explain how do we use "who" in seating arrangement? "Who" refers to immediate preceeding person. For ex: P who faces centre sits third to right of V.
Here "Who" refers to "P"
Champ, Yes it is. The method to solve the problem is the same. The "Left" and "Right" for persons facing inside and outside will be different. Note that in the diagram . You will be able to crack it. In your blog you have mentioned that when the direction is outward from the center,we should go clockwise for right ..here T is the third to the right of R.. but in your solution you have taken anticlockwise direction .. Please explain!! this looks easy as there are only two entities are involved . . i mean the aphabets and their zodiac signs . . how to approach if three entities are given , like 7 seven lecturers , taking lectures on 7 different days and wear seven diffent colours of dresses . . can u pls sovle an example for it . . This could've been a little harder if people were facing in different directions. What is the minimum time taken to solve this puzzle? Is 5 minutes along with solutions okay or too long? Everything will be fine Navneet...Just keep practising you will definitely improvement. Please provide tricks for some facing centre and some outwards..
Was it an hard one? could u pls provide some ques of this type for practice. it is easy if get more tough puzzle than it, it wud definitely hurt my mind! Copyright© 2014-15 | Privacy-Disclaimer . Powered by Blogger.